When election stories start to hit the headlines of all media channels and trend on all social platforms, business minded people smell profitable business opportunity. As the presidential face off starts to fire up — people bickering here and there, and political candidates outsmarting and overshadowing one another, there’s a crowd willing to spend. It’s time to embrace the opportunity that will bring you profitable revenue. According to experts, election season will help boost our economy because political candidates will be spending lavishly on their campaigns. Here are some profitable business ideas you can easily start, according to various financial analysts and economists that will definitely boom before, during and even after the election. 1. Customized giveaways. Who says that giveaways are only for parties such as birthdays and weddings? Political candidates show their supporters how much they appreciate them by giving away customized mugs, printed shirts, jackets, keychains, pins, etc. This is also one way of remembering not just their names but their faces as well. 2. Catering services. Food is always the main attraction in any event. Wow them with your cooking and presentation skills on any political gatherings, meetings and celebrations. 3. Photography. No occasion will be complete without capturing those precious moments. So, get your camera to work and keep your calendar fully booked during political events and campaigns. 4. Event planning. Put your expertise and organizing prowess to good use. You will be needed for political party gatherings or meetings and most of all victory parties. 5. Jingle Composition. A great jingle or music is very helpful before election. If you can’t sing, you might as well just write music. This is one way of making a trademark for each candidate. 6. Hosting. The host or the emcee is always the life of every event or show. You can earn a lot by being the emcee for a political campaign. 7. Tarpaulin making. This kind of business is very lucrative nowadays. Rain or shine tarpaulins are everywhere. You can see them on birthdays, weddings, baptism, anniversaries, graduation, advertisements, etc. 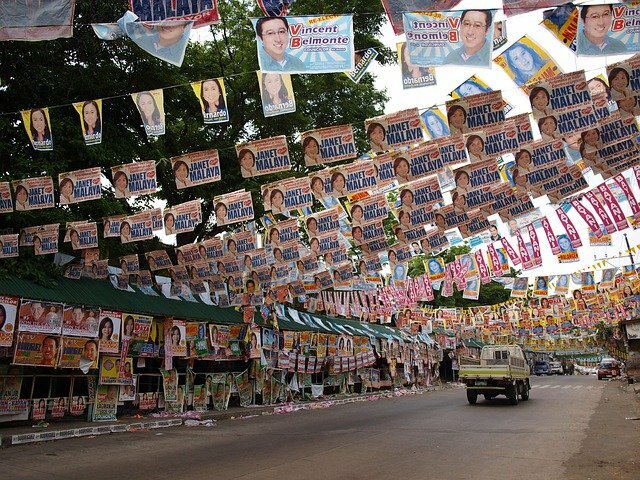 People make use of tarpaulins as a way of decorating an event, congratulating someone and remembering something. This profitable and popular business will be very beneficial to the upcoming election for politicians want to be remembered. 8. Flyers and posters. This is one of the traditional ways of campaigning and still very popular. If you have the knack for desktop publishing and creative design, take the opportunity to earn profitably this coming election. The best time to start your profitable business is now, while the election fever is still on but be sure to vote wisely!